“It is with great pleasure that I am able to republish this delightful guide from 100 years ago. 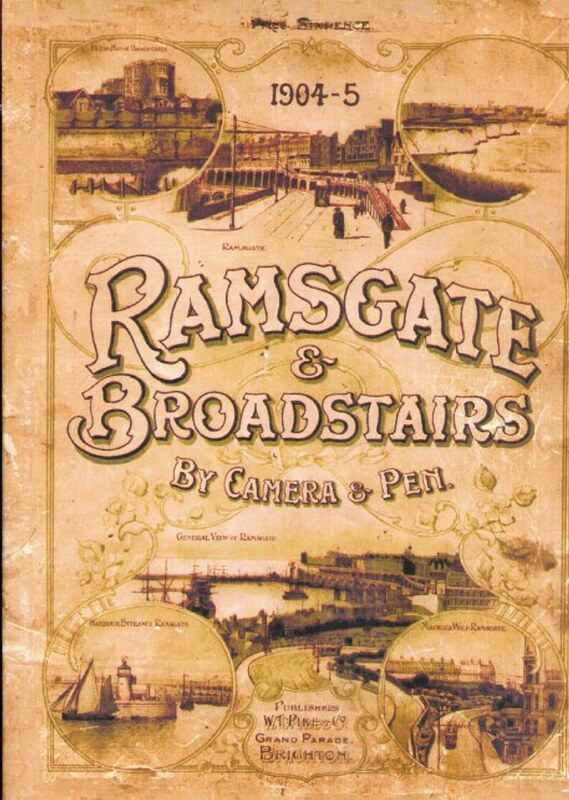 Whilst looking through this guide one can’t help being struck by the prosperity of Ramsgate at that time. As a small shopkeeper I found the advertisements for the shops in the town most charming – although Ramsgate was bombed badly during both World Wars it is surprising how many of the buildings shown in the pictures still survive. Once again I would like to thank one of my fellow collectors of local history for lending me their original copy for this reprint. As pointed out none of us can really say we own these scarce items of local historical interest, we are merely the current custodians”. 50 + Advertisers all with photos of their premises – text includes, the Ancient History of Ramsgate, Ramsgate & The Cinque Ports, The Rise of Ramsgate Port, Ramsgate Royal Harbour, The Town Government, Modern Ramsgate, Ramsgate Promenades, Ramsgate Churches, The Royal Victoria Pavilion, Amphitheatre, Water & Light, Ramsgate Patriotism, Higher Education, The Goodwin’s and the Lifeboat, Climate, Baths, and Ramsgate Environment. The Granville, South Eastern Road, Sands 1809 & 1904, Old Harbour Street, Old Docks 1792, Ellington Park, South Foreland Lighthouse, Sir Moses Montefiore’s Tomb, The Synagogue (interior) and lots more. Others - Minster Church, St. Clement’s at Sandwich, Grove Ferry, Richborough Castle / Dungeon, Canterbury Cathedral, Margate Jetty, Margate Bay, Sea Wall and Parade Westgate and Rossetti’s Tomb – Birchington Graveyard. Snow & Co. 17 High Street, Prince Albert High Street, Balmoral Hotel Albion Street. Other photos – York Gate, Trinity Church, View 1809 and 1904, North Foreland Lighthouse.